Jared Zimmerer is a man of many hats, he works full time in ministry, he is an author, podcaster, father husband and friend. And in all of that he is exemplary of striving to find balance between mind, body and spirit. This is the third book of his that I have read, and it did not disappoint. Both of his other books I have read in eBook format (which is my preferred format) I waited a number of months after this book came out in order to pick it up when I was breaking down and buying a few physical books. It was my loss that I did not give it a go earlier. That is a pretty serious list of requirements, but if you are willing to man up and give it a go this book can help build mental, spiritual and physical muscle for you and give you tools to continue on. After that challenging list we are provided with a limited list of approved foods; proteins, carbs, fats, veggies. The goal is also to eliminate fruits and alcohol for the 30 days. 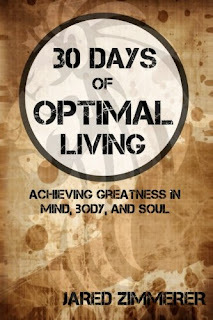 These 30 days are designed to help is establish discipline and focus so buckle down and give it a try. After a brief word or caveat on each of the three target areas we are presented with three pages for each day of this journey. Each day is broken down into three focuses, and you guessed it, body, mind and spirit. The physical component is some quick body weight exercises at 5am, a main workout and a target for total carbs for the day. Next is the mental component, a reading for reflection. Some of these meditations are from philosophers, Yeats, Bruce Lee, C.S. Lewis and many more. And yes some of them are hard, but read them and if needed reread them. And finally for the spiritual there is a section for meditation, we are instructed to find a quiet place, then quiet ourselves, and finally reflect and journal on 3 questions each day. 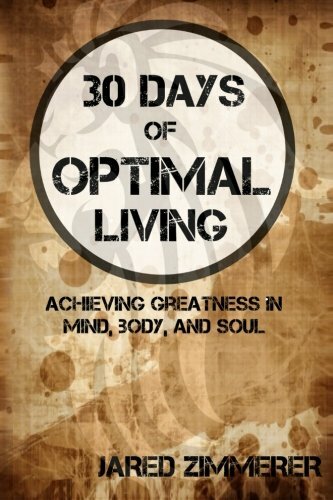 The book is intended to be a guide; a guide to help you to establishing habits for physical, mental and spiritual growth. It will show you that you can do it. It will help you to establish new or greater discipline in your life, and how to continue that growth on after reading the book. And if you are still struggling start over and do another 30 days. Is the book perfect, no it is not. If you do not have access to a full gym with cables and such you will need to come up with your own modifications for some exercises. It would be great if there was a substitution chart if you have only dumbbells or dumbbells and barbells. But overall it is a very very good tool to help you grow. C.S. Lewis stated "Mere change is not growth. Growth is the synthesis of change and continuity, and where there is no continuity there is no growth." This book will help you grow and what more could we ask for!